There are two Adminas here, fry and me (Rinoa). We are administrating the board together, so if you have questions and/or problems you can write a PM to either one of us or address us otherwise. That would be Hope, ColonelMillerSG21, Yu, Toorop and Zodiac. These five help to watch over the forum and are able to do as they please all over the forum. 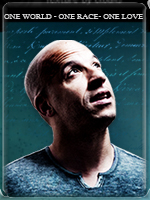 Hope and Toorop are responsible for the Vin Diesel section and Hope apart from that she is responsible for the English- and Fanfic section. Yu are mostly responsible for the AniMa Section but have the rights of a Moderator as well in other sections. They can also issue cautions, closing and deleting is reserved to the Admins. Moderators also have the right to enforce their authority upon you, otherwise they wouldn’t be LoVD-Mods! That would be Artanis, she welcomes new users and from time to time she performs other tasks as well. Well, that’s all of them, so if you have any questions or problems you can confidentially contact the LoVD Mods or the Adminas =). You will get help whenever you’ll need it. The post was edited 1 time, last by Artanis ( Jun 6th 2011, 8:15am ).